Can fashion make a noise? Can what we wear and the way we wear it make specific noises? Probably the first type of sound we associate with fashion today is some form of music. The extra loud music of fashion shows or the background melodies of department stores. Nowadays music is also an essential part of fashion advertising, it forms the sensorial backdrop that sticks in potential customers’ minds. What about the noise that fashion items (clothes, shoes, hats, fans, etc.) actually make when we wear them? Are these sounds distinctive and recognizable? Are they instinctively associated with a particular item or even style throughout history? During the pre-industrial era sounds and sound perception would have been quite different from today (just like the perception of light and darkness would have been different in pre-electricity days). So when looking at these objects we should take into consideration that the noise pollution surrounding the wearer and the listener, would have been made up of other types of sounds from those we are familiar with today. 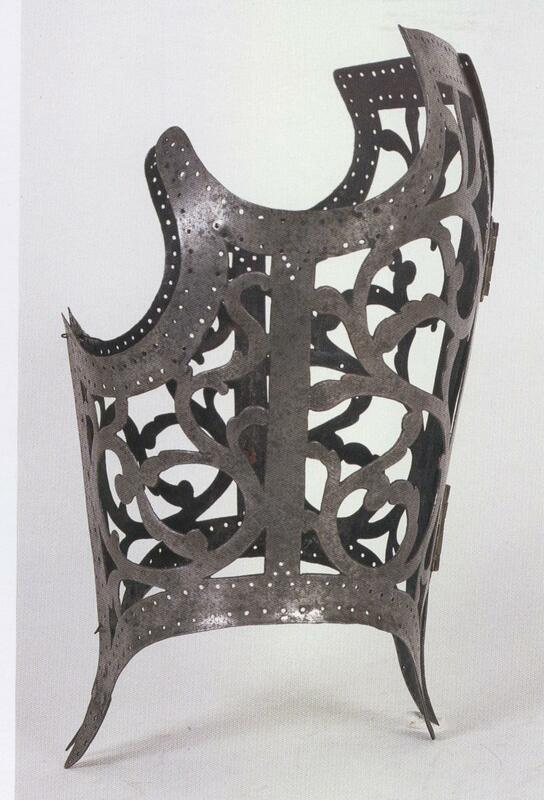 This type of metal corset was quite common amongst upper class women from the middle of the 16th Century (examples survive in museums around Europe). As we can see by looking at the right hand vertical edge, there are two sets of hinges center back. The corset therefore was front opening (it has a small clasp at the front to keep it closed). We can imagine that if the hinges were not kept well oiled, it would have made a screechy jarring noise on opening and closing it. Not a pleasant sound. But then not a very pleasant fashion item. 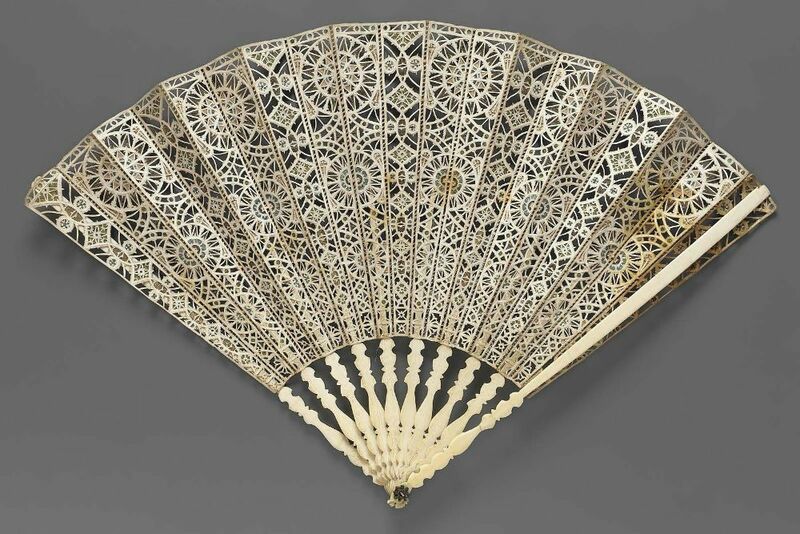 Fans were very popular in the 1500s, as they still are today in many countries around the world. Back then, women (who were wearing those rigid corsets and tightly laced bodices) would have suffered from the lack of air in a crowded room, an overly incensed church interior or simply the heat of the summer months. Fans were functional as well as decorative. 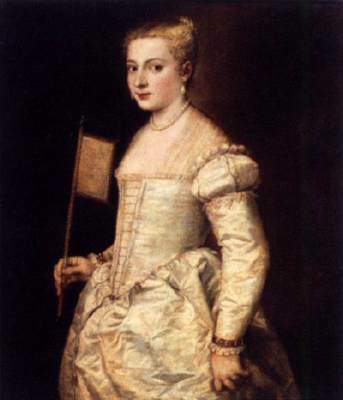 In a previous post I mentioned 16th century feather fans, but before and alongside these, many women used paper fans such as the one used by the young woman in Titian’s painting . We can imagine the swoosh swoosh noise as she flips it back and forth between her fingers. 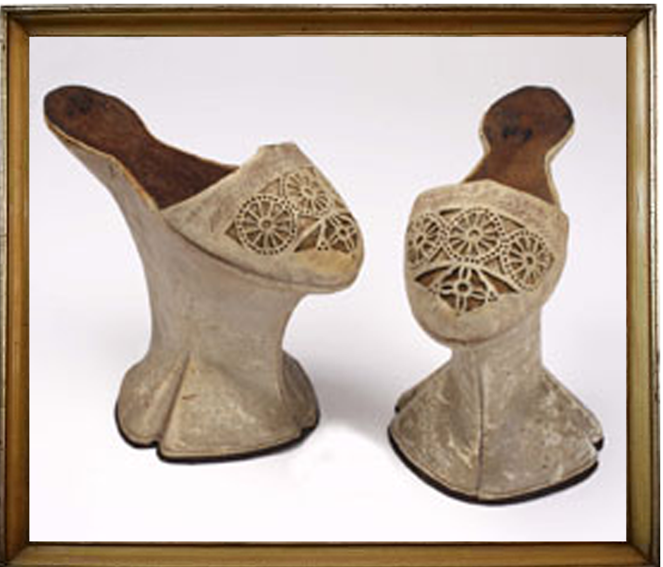 These were a form of female footwear which (in one form or another) became fashionable in various countries in Europe during the 16th century. They were essentially a very sophisticated version of the wooden clog worn by peasants everywhere throughout the middle ages and beyond. These chopins in the Castello Sforzesco museum in Milan are of a moderate height (much higher ones were the norm in Venice at this time – examples can be seen at the Costume museum in Palazzo Mocenigo, Venice). Yet they are interesting for the shape of the base – it resembles an animal’s hoof (possibly an elephant’s). The wide base provided some stability to a very precarious piece of footwear. The upper is so short and the back of the heel so narrow, that one wonders just how the lady could walk in them. Throughout the wooden clog-wearing centuries, people must have been used to a certain degree of noise emanating from them. They were generally worn out of doors on packed earth roads or in some areas even paved streets from Roman times. A common sound associated with the lower classes. If I have to imagine the sound that these chopins created, I think of a muffled thud thud noise. 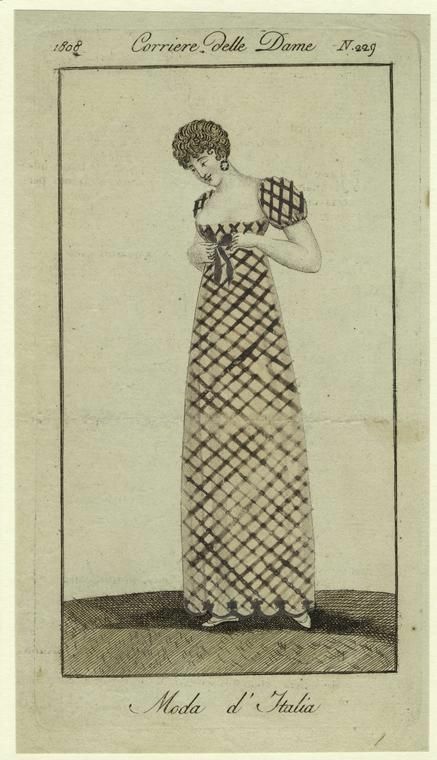 An aristocratic sound of covered wood gently thumping down on terracotta or tiled floors, as the lady – swiftly lifting the hem of her dress so as not to trip – walked through the halls of her palazzo. I have a feeling that any boned corsetry would have made noise of some description, even today i have an underwire bra that creaks annoyingly. In past centuries when boned corsetry was expected to be worn by women of higher social standing, tea parties must have resonated with the creaking, not to mention the groans from the poor women enduring such torture!